What makes you different than any other foot and ankle doctor (podiatrist) offices? If you choose to visit our podiatrist Northwest Indiana office, you will not have to ask that question. In our most humble opinion, nowhere in Northwest Indiana will you find an atmosphere that combines a sincere, amiable staff attitude in a relaxing, technologically advanced setting quite like what you will find here. By the way, there are very few foot or ankle problems our podiatrists cannot help treat — there is a reason why our podiatry office has won the “Best Podiatrist” award from the Post-Tribune and the “Best of the Region” award from the NWI Times repeatedly — in fact, an amazing nine times! Read patient reviews of our care by clicking here. More importantly, we pride ourselves in our integrity and on really caring about each patient. For example, every patient who has heel, foot or ankle surgery is personally called by our podiatrist or within 24 hours. Our goal is providing what you want or need in foot and ankle care, whether that is alleviating a painful bunion or simply discussing the best shoes for you, in the most compassionate, caring way possible. Whether you have a sports injury of the foot or ankle, such as an ankle sprain, a painful bunion, ingrown toe nail, or just a sore, painful foot, our Northwest Indiana podiatrist office can help you. Is it normal for my toe, heel, foot or ankle to hurt? Heel, foot or ankle pain is never normal. “Pain” is the body’s way of letting us know something is wrong. If you are having any type of pain, you should discuss it with one of the friendly foot doctors at our Northwest Indiana podiatrist practice. Feel free to discuss any concerns you have about your feet or ankles at our podiatrist Northwest Indiana office – especially, heel pain. Often, heel, foot or ankle pain can be alleviated relatively quickly and easily, sometimes in just one visit. My family doctor says my heel, foot or ankle pain is arthritis. Can anything be done? Possibly. Many types of foot or ankle arthritis pain can be easily and quickly alleviated. Sometimes our Northwest Indiana podiatrist will use tiny-incision < arthroscopic ankle surgery or foot surgery to “clean out” the arthritis. Arthroscopic surgery is often done for arthritis in the ankle and patients love it because they do not have to use crutches afterwards. When people have suffered with foot or ankle arthritis for a long time, our doctors may need to “open up” the joint to remove the arthritis or damaged bone or cartilage. When the arthritis is very severe, our doctors can replace the joint with a new one. This “joint replacement” procedure takes about 45 minutes and most patients can walk without the use of crutches afterwards. What about my children, should I be concerned about the way my child walks? If you are worried about the way your child walks or have a pertinent family foot health history, then you should bring your child in for a visit. Pediatric children’s foot problems are often best addressed as early as possible. Learn more about pediatric child foot problems by clicking here. I have diabetes. Should I see you? Yes. Anyone with diabetes or a diabetic foot problem should see us at our podiatrist Northwest Indiana office. Even if you do not have a diabetic foot problem (or worse, a diabetic foot infection) right now that you know of, if you are diabetic you should see us at least once a year. Our Northwest Indiana foot doctor will evaluate your feet to assess the risk for complications like nerve damage and circulation problems. You may benefit from a simple shoe modification or special insole (a foot orthotic) to help distribute pressure across the bottom of your feet and help prevent open sores or infections from developing. My feet are numb. Can you help me? Possibly. Numbness, including burning, tingling and shooting pains (pins and needles) may be due to diabetic neuropathy or other types of neuropathy. A patient with a nerve entrapment can have numbness or burning pain or other abnormal sensations in their foot. Some nerve problems our foot doctors see includes pinched nerves, tarsal tunnel syndrome and neuroma pain. The foot doctor at our Northwest Indiana office will thoroughly evaluate the cause of your numbness, burning or tingling and in some cases they will be able to restore normal sensation. Please click here to read about Nerve Problems, Neuropathy and Numbness. I was told that foot orthotics can help me. What is an orthotic? A foot orthotic is a custom-made arch support that slips into a shoe and oftentimes alleviates many kinds of foot, ankle, leg, knee, hip, back pain and just plain tired, cramping feet. Our Northwest Indiana podiatrist office specializes in making our patients expert custom-made foot orthotics. 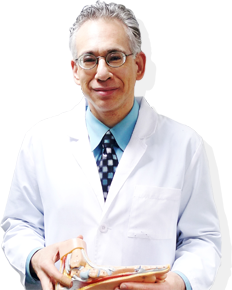 Dr. Nirenberg first thought about becoming a podiatrist when a podiatrist alleviated his father’s knee pain with foot orthotics. Even today, more than 20 years later, Dr. Nirenberg’s father still wears orthotics to keep his knees feeling great. To learn more about our custom made foot orthotics Click Here. Can serious medical problems first show up in the feet or ankles? Your feet and ankles are often a mirror of your general health. Such conditions as arthritis, diabetes, nerve problems, circulatory disorders and even thyroid problems, can show their initial symptoms in the feet or ankles — so foot or ankle ailments can be your first sign of more serious medical problems. In fact, Dr. Nirenberg found a patient who’s foot pain was due to a tumor in his neck. The fascinating case was published in a medical journal and reported in the NWI Times – click here. If you believe you may have serious medical problem that is contributing to your foot or ankle issues, call us for an appointment today at (219)663-2273. Is there a way I can ask the foot doctor questions directly? Our Northwest Indiana foot doctors love answering medical questions. During your podiatry appointment, feel free to ask that any questions you may have. If you wish to speak to a foot doctor by telephone, they are usually unavailable during work hours, however, if you leave them a message, they will make every effort to call you back within 24 hours. If you are in severe pain or have an urgent problem, be sure to explain the situation to the receptionist and she will make every effort to have foot doctor call you back even sooner. Do your podiatrists provide second opinions? Yes. Many patients see us for second opinions, either because their doctor has suggested that they see us or they decide on their own to to get a second opinion for their foot or ankle problem or surgery. If you would like to have a second opinion podiatrist evaluation, please call us at (219)663-2273. I’m afraid to go to a podiatrist, but I know I should. What can I do? Don’t put off seeing a foot doctor any longer. Make a call to our friendly Northwest Indiana podiatrist office and allow our staff to help you! Be sure to tell us about your concerns. By developing a relationship with our podiatry office, you are also involving yourself with your podiatry treatment plan. Our foot doctors can discuss options to help you control and decide your own treatment and techniques to help you relax and feel more comfortable during your visit and with your podiatry care. Absolutely! Our Northwest Indiana podiatrist office will always accept new patients with heel, foot or ankle pain or problems! We look forward to exceeding your expectations with our podiatry care. To schedule an appointment with us please call: (219)663-2273 today or make an online appointment by Clicking Here. We love referrals – from other foot and ankle doctors as well from happy, satisfied patients. In fact, your referral is the highest compliment that you can give our Northwest Indiana podiatrist practice. Our podiatry office welcomes your referrals and will always strive to accommodate the needs of your friends and family. However, you might send your enemies elsewhere! Yes! We are open every other Saturday from 8 am to 12 pm and Tuesdays from 8:30 am to 6 pm. Please call our Northwest Indiana podiatrist office today to schedule your appointment! Our podiatrists see patients Monday through Saturday. Monday, Wednesday, Thursday and Friday we open at 8 am and close at 5 pm. Tuesday we are open from 8 am to 6 pm, but close from 12 to 1:30 for our weekly team meeting. Every other Saturday we are open with Saturday hours from 8 am to 12 pm. If you need an early or late appointment, be sure to let us know and we will do our best to work around your schedule. To schedule an appointment with us please call (219)663-2273 or make an appointment online. We pride ourselves on being able to see most patients within 48 hours of them calling our office. However, if you are having severe foot or ankle pain or have an infection, please let the receptionist know and we will try to see you even sooner. To schedule an appointment with our conveniently located Northwest Indiana podiatrist office please call (219)663-2273. Can I choose which doctor works on me? You can always request your “favorite” foot doctor. We note this in your file and make every effort to insure that you get treatment from the doctor you want. Occasionally, due to illness or some unavoidable delay, we are unable to honor these requests. If this happens you will be offered the option to reschedule or see the other doctor. The address is 50 West 94th Place. Our phone number is (219)663-2273. I’m a new patient and know there are probably forms to be filled out. Can I do them in advance? Yes! We love when people fill out their forms ahead of time. Simply Click Here to print our new patient forms. Don’t forget to bring them with you for your first visit! If you have any questions filling the forms out, please give us a call and we will help you. What are the different insurance and payment options you provide? We gladly accept nearly every health insurance plan including Blue Cross Blue Shield of Illinois, Indiana and Michigan; Anthem, United Health Care, Cigna, Humana, Aetna, Prairie States, Sagamore, PHCS, Sheet Metal Workers, Highmark, Iron Workers, Great West, Anthem HIP, UniCare, WellPoint, ICHIA, Medicare, Professional Benefits, Coresource, Starmark, Professional Claims, TriCare, Iron Workers, First Health, Chicago District of Carpenters, Chicago Laborers Health & Welfare, AARP, J.F. Molloy, Principle Life, HFN, Fortis, NALC, Allied Benefit, Medicare Advantage Plans, Medicaid and dozens of others. We gladly file insurance for you with these and most other insurance plans at no charge. 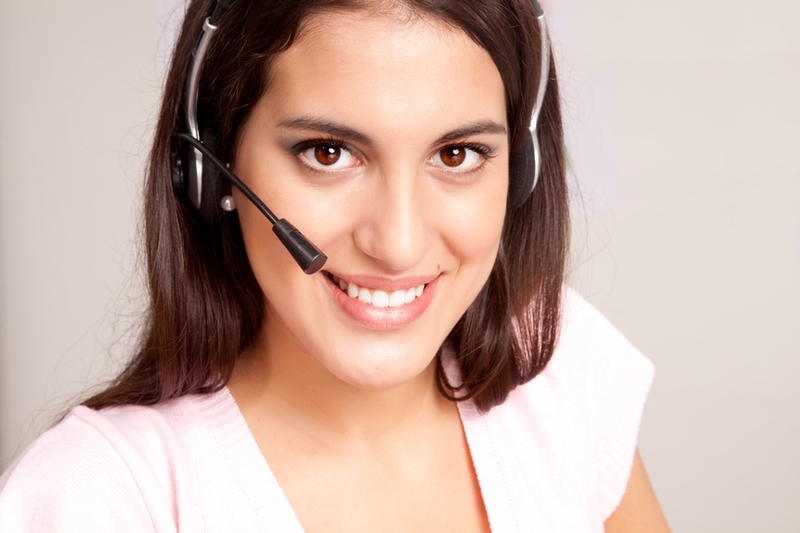 To see a complete list of the insurance companies that we accept Click Here. In terms of payment options, we gladly accept all major credit cards (MasterCard, Visa, Discover and American Express) and of course, cash and checks are good, too! In addition, our insurance staff is very approachable and understanding of patients’ financial podiatry concerns. They will be happy to meet with you personally to help answer any questions you may have or to help solve a podiatry insurance or financial issue for you. We accept cash or check and offer low-cost cash for service, reduced prices for people without insurance and need to pay cash for their podiatry care. To learn more about our payment options, cash options and affordable cash payment plans, Click Here. I heard your doctors often do a plastic surgery closure when patients need surgery. What is this? Depending on the patient and their particular foot or ankle problem, our Northwest Indiana foot doctor will often use plastic surgery techniques to close the skin. This is something that, as far as we know, sets our practice apart from most others. All the sutures are buried under the skin and they all dissolve. Typically, this results in a much less visible scar and patients love not having to have sutures removed. Read patient reviews by clicking here. One of the reasons our podiatry practice has repeatedly won the “Best Podiatrist” award from the Post-Tribune and “Best of the Region” from the NWI Times is our use of high technology to help alleviate foot and ankle pain. Read patient reviews of our care by clicking here. What is the revolutionary PRP (platelet-rich plasma) procedure? When two of the Pittsburgh Steelers’ biggest stars, Hines Ward and Troy Polamalu, had muscle-skeletal pain, it was the breakthrough PRP procedure that allowed them to resume playing and go on to win the Super Bowl. Since then, many professional athletes have undergone PRP. Our doctors are among a handful of podiatrists now using PRP to treat heel, foot, ankle and achilles tendon pain and problems. The PRP treatment is very easy. A sample of the patients own blood is specially treated and then placed around the painful area of their heel, foot, ankle or achilles tendon. PRP alleviates pain by using the patient’s own cells to heal the sore or injured tendon, ligament and other soft tissues. The procedure takes about 20 minutes and most patients resume almost all their activities within a few days. What is the Endoscopic Release Procedure for Heel Pain? A new breakthrough to alleviate heel pain caused by inflammation of a large ligament in our heel (the plantar fascia) is the endoscopic release procedure. This simple, out-patient procedure takes just a few minutes and uses a special fiber-optic camera, called an endoscope, to enter the painful heel through a tiny incision. The endoscopic camera allows the doctor to examine the ligament and with a special instrument, he can release part of the ligament to lessen the pain. If you have heel pain or arch pain, give us a call today to see if the endoscopic release might be able to help you. Call us at (219)663-2273. What Is Ankle Arthroscopic Surgery? Many people who have ankle arthritis or other painful conditions believe nothing can be done for them. Ankle arthroscopic surgery is an easy, out-patient procedure that uses a small fiber-optic camera that may help remove arthritis and inflammation from a painful ankle joint. The doctor puts small camera into the ankle joint through a tiny incision and uses hi-tech instruments to “clean out” the arthritis. To see if ankle arthroscopic surgery is indicated for your ankle arthritis, make an appointment today for an evaluation. Call (219)663-2273. Laser beams can be used surgically to treat many foot and ankle problems that previously had to be dealt with by cutting the skin. A laser uses a precise and intense beam of light that can vaporize tissue almost instantly. There is usually little or no bleeding and the laser also sterilizes the skin surface. There usually is less pain and a shorter recovery time than with conventional surgery. We use two kinds of lasers: the pulse-dye laser and the CO2 laser. For many patients our podiatrists can alleviate heel, foot and ankle pain and problems by working through very tiny incisions. Minimal incision surgery allows patients to return to their normal activities faster and with less pain. Minimal incision surgery leaves a very small scar and the risk of complications, such as an infection, is much less. Depending on the extent of the problem and the patient’s other medical issues, our podiatrists may use minimal incision surgery for arthritis, hammertoe deformities, bunions, heel pain, ankle pain, nerve problems and many other foot and ankle problems. What is “Invisible Shot” technology and how does it make shots not hurt? Invisible shot technology uses a special instrument, called the Vibration Anesthesia Device, to lessen the pain of receiving an injection in the heel, foot and ankle. The device is provided as a service free to our patients who need to have a shot to help alleviate their pain. The device works by vibrating the skin of the foot so the patient’s brain becomes distracted. The patient may not feel the shot at all or may feel it to a much lesser extent. Either way, it makes needing to get a shot less painful (and less scary too). The device works for most people, but not for everyone. The NWI Times newspaper featured our doctors using this remarkable technology on the paper’s front page! Diagnostic ultrasound is an easy, quick and painless way for our doctor to evaluate the soft-tissues (tendons, ligaments, nerves, muscles) of patient’s feet and ankles. Many people are familiar with ultrasound being used by obstetricians when evaluating babies in their mother’s womb. It is just as beneficial when treating heel, foot and ankle pain and problmes. 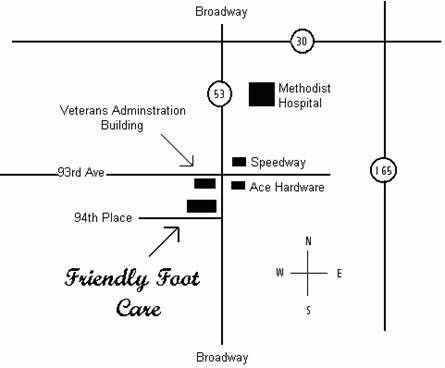 Friendly Foot Care was among the first podiatry office in Northwest Indiana to offer this technology. Our doctors often use ultrasound when treating tendonitis, heel pain, plantar fasciitis, pinched nerves, neuromas, foreign bodies (such as splinters or pieces of glass), wounds, tendon tears and many other foot and ankle problems. 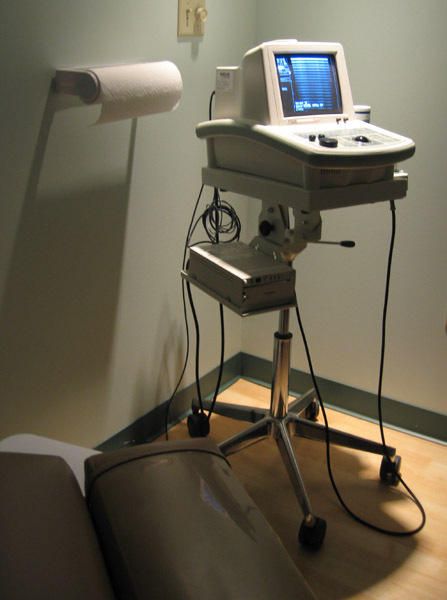 Click here to see our diagnostic ultrasound. What are foot and ankle digital x-rays? Digital x-rays of the foot and ankle are taken of your feet and ankles in our Northwest Indiana office. Digital x-rays use a special sensor that is connected to a computer to capture high-resolution, extremely sharp images of your toes, foot and ankle. The result is a higher quality x-ray with more detail and often less radiation than conventional x-rays. The podiatrist can then analyze your digital x-ray on a high-tech computer and depending on your problem, he will use sophisticated software to evaluate the x-ray. This digital x-ray software allows the podiatrist enhanced ability to detect diseases and problems in the foot and ankle. And as an added plus, digital x-rays are environmentally friendly! The flouroscan is a special x-ray device that lets the doctors see the bones in your feet and ankles “live” as you move them. The flouroscan is superb for examining painful joints for arthritis, spurs or loose bone fragments. We are proud to use a state-of-the-art Electronic Medical Records (EMR) computer system in our office. Our Electronic Medical Records system has allowed us to replace patients’ paper charts with securely encrypted, HIPPA compliant, electronic files. Our Electronic Medical Records are always easy to read, easy to share with other physicians and most importantly, our EMR system offers patients “portal” access from the comfort of their home (or anywhere else) 24 hours a day, 7 days a week. You can visit our patient portal by clicking HERE. How do the doctors keep up to date on all the current techniques? You will be hard-pressed to find a procedure, material or technique with which our doctors are unfamiliar. Aside from the many clinical journals they read and the courses they attend, they get updates and news from all over the world via the Internet. This is an invaluable resource for keeping our office on the leading edge of technology and foot and ankle research. In addition, both our doctors have always obtained greater than the minimum number of continuing education hours than the State demands. I’ve always been nervous about getting x-rays. What do you do to make them safe? Realistically, the x-ray doses required for podiatry are relatively harmless (for anyone who is not pregnant). However, we recognize your concern and we use a special x-ray machine specifically designed to x-ray the foot and ankle, and we strictly adhere to state rules and regulations. We also use digital x-rays, which usually require much less radiation than conventional x-rays. Another podiatrist treated me and I still have problems. Can your doctors help me? Patients who have had prior treatment often see a podiatrist at our podiatry practice for a second opinion. Our podiatrists enjoy treating challenging problems and they are often able to lessen these patients’ pain and improve their problems. Dr. Nirenberg is one of the few forensic podiatrists in the U.S. and loves a good challenge. To read more about Dr. Nirenberg’s forensic cases Click Here or read patient reviews of our expert care by clicking here. Sometimes people see us for a because they want a second opinion podiatrist to discuss treatment options or surgery or just because they feel they have a complicated foot or ankle problem and need a podiatrist who is going to take the time to puzzle-out what is causing their pain or problem. If you need a second opinion podiatrist call us today at (219)663-2273. Our Northwest Indiana podiatrist office treats patients from Valparaiso, La Porte, Crown Point, Merrillville, Schererville, Griffith, Dyer, Gary, Portage, St. John, Schererville, Highland, Lowell, Chesterton, Cedar Lake, Wheatfield, Hobart, Hammond, Munster, Lafayette, Michigan City, Kouts, East Chicago and Valparaiso, and Chicago! Call us today or make an appointment now – CLICK HERE!